How Do I Set Up My Google Places Account for SEO? Suzie in Georgetown, Massachusetts wants to know everything about how to optimize her new Places account. It’s actually a good question because if you screw up your new listing, it can take years to unwind mistakes most people make. I’ve read how you can mess up a new places account when claiming your business profile. What’s the dealio? Suze, you are wise to think about your new account. If you haven’t claimed it yet nor confirmed your listing, be careful. Too many SEO people recommend optimizing your GP account with your keywords. Don’t! Well, what I mean is you need to be careful how you tag your account with your target keywords. Way back in the day companies in the search biz would tell you to insert your keywords into text content describing your services. Big, fat mistake. Google actually frowns on this deceptive trickery. Instead, first start by following Google’s guidelines to claiming your business listing. Don’t be lazy:-). Submitting your new GP account requires plenty of content. The smart choice is to take your time and provide all the content they require. Too many listings skip information that is required for a fully optimized account. Read Google’s business listing quality guidelines and apply them to yours. At this writing you can add 5 YouTube videos into your GP account. This is critical for ranking well in Places search. I recommend you title each video with one of your target keywords. If you’re in scramble mode worried about how to produce your videos, here’s a good post to get you started finding qualified people to help with video production. Don’t make a rookie mistake ignoring the benefit of having YouTube videos linked to your GP listing. It’s a major factor that can help your listing rank well. Images, or photos are another method that so many people ignore. I believe you can upload 20 photos or graphics. Go wild and do the 20 with one caveat. They need to be stunningly beautiful images that you own. Don’t steal Google images. Obviously stealing is wrong. 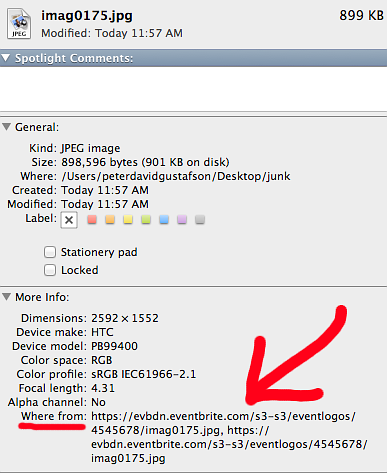 However, using images from any site comes with a sneaky little piece of code. All images have a tag embedded in them which reveal where they’re from. As you can see by the image to the right, it’s easy for Google to tell if you’ve stolen your graphic or photo. Another piece of the puzzle with graphics is how searchers click through GP listings. The more eye-catching your photos are the better chance you’ll have someone will click your GP link. So think about photos that truly embrace your product or service. I recommend you use smiling faces of people. Smiles always capture attention. Besides, people are buying your services or products so happy ones tend to associate your business with hapiness. This is where most new users fail. You can add up to 10 categories that relate to your business. Be very precise when selecting yours. The first three are critical. If you need help finding categories, I recommend using the Google AdWords Keyword Tool. Sign in and start searching for keywords related to your business. Often word phrases you think people are searching for to find you are wrong. Try using words with your city to find related keyword phrases being searched. If you sell ‘dog grooming’ services in Seattle, include the word Seattle with different word variations. Google will display related keywords with monthly search counts. Aim for ones that have 100-500 searches per month.